My name is Tyson and I'm a 38 year old single father. Currently I am a Reentry Program Manager for the Lummi Nation and operate a Men's Reentry Center that works with incarcerated community members that live within my facility. I used to be an all-around athlete at 195 lbs competing in summer time Coastal Salish war canoe & Hawaiian outrigger racing. I also played recreational soccer year round for the past 35 years. I loved running at least 3 miles every single day. 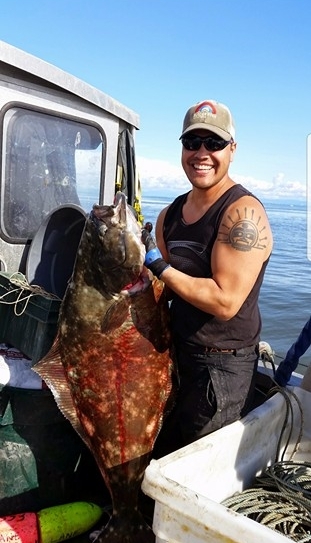 I am also a tribal commercial fishermen boat captain here in the Salish Sea and while I have been doing this my active life still nearly came to an end three years ago I suffered a debilitating work injury after shimming up a 1500 lbs algae tank. Keep in mind I used to do this 10 times a day with no problems as I was an extremely fit and an active guy at the time. This injury uncovered a deteriorating condition in my body that required 5 reconstructive surgeries and an entire year spent on bed rest. The surgeons put me on pain killers, a liquid diet, and 5 lbs maximum lifting restriction for that year and a 15 lbs restriction the following year. It took me years to recover from the constant pain and extreme level of inactivity. I suffered body pain from my neck all the way to my ankles over the last few years. I had extreme weight gain and went from 165 lbs to nearly 240 lbs. No matter what I did it was almost impossible to get back to what my expectations of my physical self were. Over the past year I dedicated my life and work to trying everything in my power to getting H.E.A.L.T.H.Y. HEALTHY stands for: Hope, Encouragement, Activity, Love, Transformation, Honesty, YOLO - you only live once. So I got back into the weight training and fought through the pain, started eating better, and used every moment I could to be active with my son. But I needed something more. I needed that extra push to get past the monotony of life. My son joined the West Coast Fight Club MMA team a few months ago and one day as I sat at his practice I saw that Flex Movement Lab classes were going to start. I figured if my son is going to be at his practice and I have a chance to take a clubbell yoga class in the same building, at the same exact time, then I'm all for it. Before Flex Movement Labs I had never taken a yoga class in my life; to be honest I never thought yoga would be for me. I was mistaken... I became obsessed about it. I went from a guy who couldn't put on his sock without being pain, to a guy who's never been physically stronger and more flexible; and best of all - PAIN FREE! Not only that, my belt now tightens two holes tighter. I've been a student since the beginning and I'm 100% grateful for the results. I continue with my regular day-to-day weight training but some days my work interferes with my workout schedule. But I won't sacrifice my Flex Movement Lab classes. When I look forward, I see myself continuing with Flex Movement Labs and moving to the more advanced classes. The use of smart phone apps and technology are very accommodating. The instructors are phenomenal! They push you but respect your own pace. We are here to learn about our bodies and to how work and strengthen them. In my mind these classes are about discovering a lot about yourself and improving your own quality of life. Get on the Flex Movement Lab band wagon; you wont regret it.